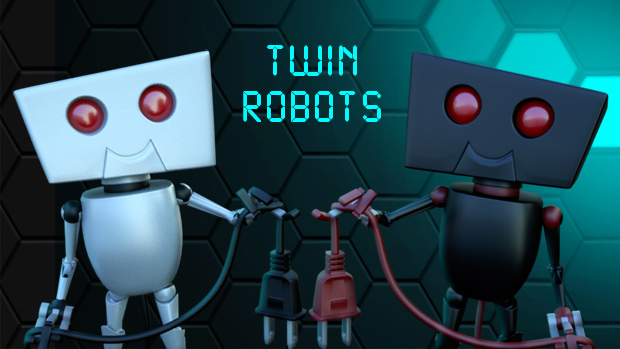 On a day like today, on December 21st 2013, Twin Robots debuted on OUYA, the first platform where it was released. A year has passed since, so today seemed appropriate to finally look back and write a post mortem on the game. Bear with me as this is my first post mortem ever! It will focus on the development pre-launch, whereas on an upcoming post I’ll write about what happened after that. Do you have a Nvidia SHIELD? Are you planning to buy an AndroidTV device? Well then you should know that Twin Robots has just been released on both platforms! 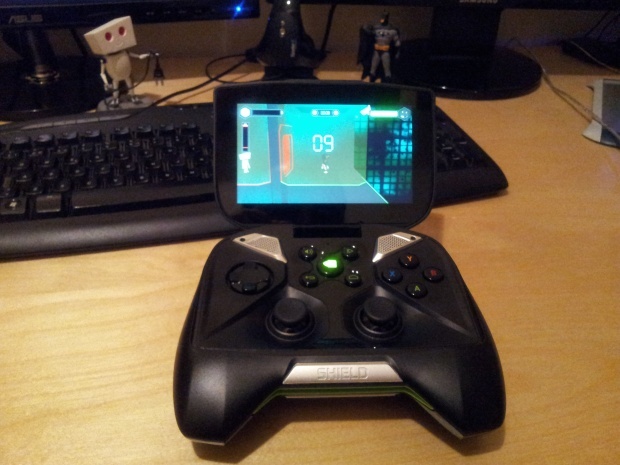 The SHIELD, thanks to its Tegra 4 GPU, is capable of running the game at 60fps! This provides a smoother gameplay experience, and its great gamepad helps a lot too. All in all, this is now one of my favourite platforms where to enjoy the game. It will show up on TegraZone soon, but meanwhile you can grab it directly from Google Play. AndroidTV has just been unveiled at Google I/O, and these little robots were so excited that jumped on board as soon as they heard about it. So, they will be waiting for you as soon as you get your new & shiny AndroidTV device. Just search for Twin Robots on the store! The day has finally come: Twin Robots is now available on Windows, Mac, Linux & Android. Have a look at the game page here and choose your preferred platform! It’s been a loooong way to get here but here it is at last. I’m very proud of the final result, and of course this wouldn’t have been possible at all without the awesome-sauce of Unity’s multiplatform capabilities. It’s just crazy how many different platforms you can target using almost the same codebase… and I’m not even targeting all the supported ones! If you are a gamedev you sure have heard about it, but just in the case you’ve been trapped in a cage for years and don’t know what I’m talking about, do yourself a favour and have a look at Unity’s website. So, now that desktop & mobile versions of the game are ready… what comes next? Well, these two little robots are going to make a jump and have some fun on the PSVita, so that should be the next target where they’ll be running on! Twin Robots – Update 1 is coming! The main new feature is the ability to share energy between robots: in single player mode you press a button and the current robot starts sending energy to his twin, who receives it automatically. In multiplayer mode both players need to press the button to agree on the energy exchange. Thanks a lot to Andrew Perry for suggesting this “helping” mechanic! Save Sea Turtles! – Now on Amazon Appstore too! Over 8.000 people have already saved tons of baby turtles from getting killed on their way to the sea; Now is your turn! If you get your Android apps from Amazon Appstore, you can now get “Save Sea Turtles!” from there too! 00:10 The “BUY” button on the main menu retrieves the current price directly from OUYA’s server, so in case of a sale, discount, etc. the text on the button will automatically update. If there is no network or there is an error, the button reads only “BUY”, but it doesn’t matter because in that case you won’t be able to buy the game anyway. Also, you can see a new messaging system in place, with custom notifications retrieved from Scoreoid’ servers; the beauty of that is I can update those messages at anytime, easily comunicating with players. Again, if there is no network then default messages show up. 00:18 This is how the credits screen is set up. I included it in the video to show it to the cool people at freesound.org; also included Scoreoid’s logo in here. 00:27 This is the config / settings screen, allowing you to define a screen scaling so everything fits nice inside your tv and a brightness setting so you can lighten up the game a bit if it’s too dark for you. 00:55 First level is shown in single player mode. This levels introduces you a bit to the mechanics so that’s why you see some help panels over there. That only happens on this level. 02:22 This is how you buy the game. One single purchase unlocks all levels. No DRM, no online checks, no calling home, no nothing. You buy it, it’s yours. 02:55 Second level is shown here, now in multiplayer mode. So, right now I’m building all the levels and then… maybe some more fixes here and there and… launch! There’s been a while since my last update on this game! Well, I’ve been working on it quite a bit, but there was not a lot to show off so it just stayed in the dark for a while. Lots of boring bugs have been fixed and endless tweaks have been made, along with lots of new scenery obstacles/items which I won’t show to not spoil the fun! I’ve been working on getting it to run on the OUYA, and it’s going well! Also, just got crossplatform leaderboards working thanks to the awesome Scoreoid service! Still lots of work to do: I have to add several sfx more, build all the levels, start working on the multiplayer options, the IAP screen… Speaking of which, I’m not so sure I’m 100% comfortable with the “BUY NOW” button; I’ve read all across the internet about people getting trouble in finding the “BUY” button in lots of OUYA games, so I thought I’ll make it pretty obvious. The 1st version actually read “BUY ($5)” so it’s pretty clear what the price of the game is (this is another concern I’ve read about, people want to know how much is it before clicking on “BUY”). What do you think? Red button to pop-out, or normal button like the others? Generic “BUY NOW” text or “BUY ($5)”? Obviously once you have purchased the game this button is not there anymore. Sorry about the crappy video, recorded using my phone. Save Sea Turtles! – Now on Samsung Apps too! If you happen to have a Samsung device and for whatever reason you prefer to get apps on Samsung AppStore, you can now get my game “Save Sea Turtles!” there too. I got this one there following the 100% indie initiative, so I’ll get 100% of revenue for a while which is nice… as long as there is any revenue at all. Whatever your choice, if you end up giving it a try… hope you enjoy it! A new gameplay video is here! Objectives are now clearer, I think: First you’ll have to find a big red button that switches off main power (this stops the big piston and opens the prison door too, so your brother can get out), then you’ll just rush to the exit. Exit door will need energy to be opened, your energy, so be careful with that since hanging around wastes your energy (I’m still thinking about implementing auto-recovering energy when idle… Not a big fan of it but it’s an option to be considered). Switching off light tiles on the floor gives extra points, but it’s not mandatory. A visual indicator for the big piston, so you can clearly see its current position from anywhere in the level. Two new mini-cameras! One gets activated when your brother is about to get crushed and the other one when you set him free. Several new sound effects have been added, and others have been tuned a bit. A new small gameplay video! I’ve been working on lots of things! Sadly the lack of updates on the blog is due to the fact that most of these things I’ve been working on are not visible; it’s mostly coding and bug hunting.